This Diploma Frame is the Perfect Tool in Mounting Photographs. The Cherry Wood Holder Can Be Used in Any Home Décor theme or within a Business! 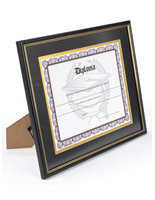 Purchase This Diploma Frame from America's #1 Source for Framing Accessories! Removable white mat for displaying larger size prints. Includes glass lens to protect the content from getting damaged. Features easel and mounting hooks for countertop or wall-mounting displays. Made from polystyrene to achieve a low price point compared to wooden-made profiles. 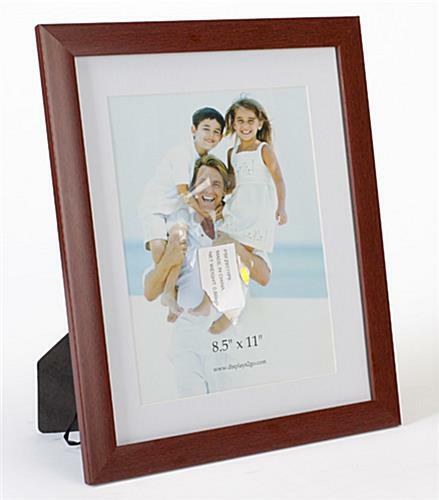 This picture display, diploma frame that is lightweight is offered at a low price online. For budgetted buyers that are looking to purchase at affordable photo holders, this certificate displayer will be the perfect. This diploma frame is constructed from polystyrene plastic. The material makes the unit less expensive compared to casings that are made from real wood. 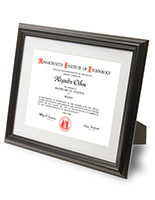 This diploma frame that is constructed from polystyrene plastic has a beautiful cherry wood-grain color. From a distance, the profile looks as though the unit is made from real wood. 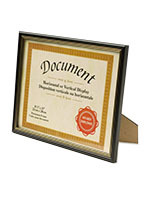 This certificate holder, 8-1/2" x 11" diploma frame comes with a white mat board. Users have the choice to show two different size prints; 8-1/2" x 11" with mat or 11-1/2" x 14" without matting.The modernized design of this ready-made college diploma frame makes the unit perfect for use in many locations. 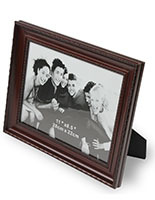 This 8-1/2" x 11" display can be used in a residence to display treasured memories like family portraits, graduation pictures, or grandparent snapshots. 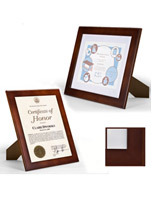 The college diploma frame that has cherry wood-grain finish could also be used in an office or other business establishments to show a certificate, award, license or artwork. Sometimes, retailers also use the countertop display at the registry to advertise new styles, communicate ongoing sales or clearance events. 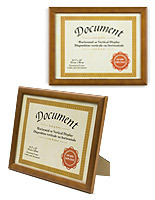 This diploma frame, such as certificate holder and picture display can be displayed on the countertop or wall. 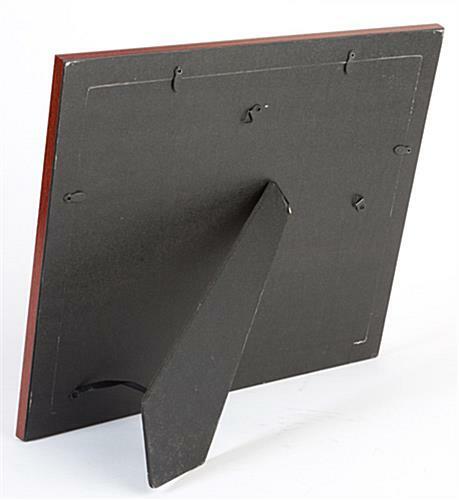 At the back of the backboard, there is a dual-sided easel and pre-installed mounting hooks giving users the option to show vertical or horizontal-style prints in two different ways! Each unit is sold with a front glass overlay included to guard the content beneath from dust and fingerprints. The photo holder features sliding clips at the back of the backboard to secure prints against the protective glass overlay. 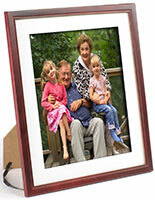 There are many sizes and styles of picture frames sold online. Get this certificate holder from this reputable supplier. 13.9" x 15.9" x 0.5"